Maybe you could be in for the chance to attend the wedding of the year. Prince William and Kate Middleton will reportedly invite 100 members of the public to their wedding next year. According to The Sun, a ‘Golden Ticket’ draw will decide who gets the opportunity to attend the service at Westminster Abbey on 29th April. The paper reports the exact format of the draw has yet to be confirmed, but winners will also toast the couple at a special reception at Buckingham Palace. 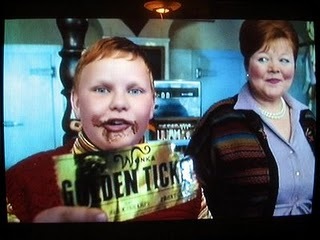 The source likened the draw to winning a Willy Wonka golden ticket. It’s not every day you get a royal wedding invite through the post! Let’s just hope they don’t get any Gustav Gloop’s eating all that lovely wedding cake. With Easter the week before and May Day the next Monday, it means Brits will have EIGHT days off in 11. How will you prepare for the nationwide knee’s up? JLS have revealed their Outta This World tour will be Twilight inspired. They’re warned that it might be a bit racy with a lot of ripping off of clothes. Raunchy stuff! Rehab-regular Lindsay Lohan has already been threatened with 30 days in prison for every probation violation by Judge Elden Fox, but it appears that she hasn’t heeded that warning – reportedly failing not one, but two random court-ordered drugs tests. We’ll soon hear the tip tapping of tiny feet in the celeb world, Pink is pregnant! There has been lots of speculation in recent weeks, but today on Ellen Pink said, “I’m eating for two these days,” confirming the rumors. Kim Kardashian has proved the celeb lifestyle isn’t all drinking champers and attending fancy award ceremonies. She’s attended the opening of a toilet, cutting the ribbon of the US themed stalls. I’m imagining Statue of Liberty themed seats-ouch.